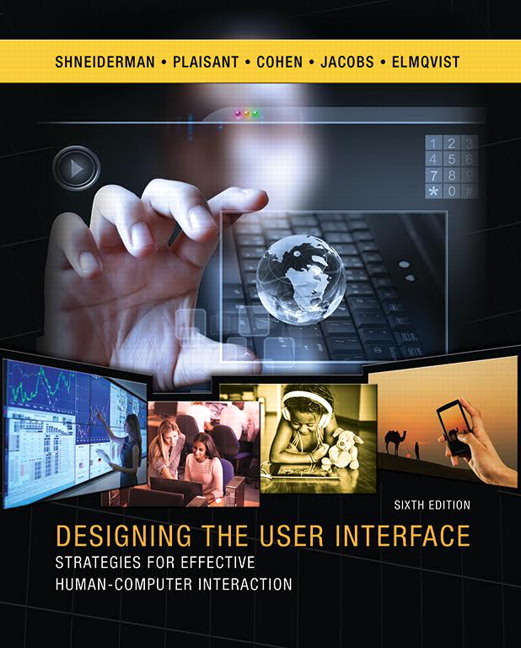 Since its first edition in 1986, Designing the User Interface has been a cornerstone in the conversation about human-computer interaction. Its revised 6th edition includes contributions from several HCIL members. Ben Shneiderman’s Designing the User Interface has been described as an “all-time classic” in the field, and for good reason. Over six editions and thirty years, it’s secured a place as one of the quintessential texts on user interface design. Among its many other contributions, it is well known for Shneiderman’s “Eight Golden Rules of Interface Design,” which are frequently invoked by HCI experts. In addition to revising each subsequent edition to address advances in technology and practice, Designing the User Interface has also evolved to reflect the changing concerns of the discipline, moving to incorporate topics since earlier editions, such as virtual and augmented reality, universal usability, social media, and information visualization. Over the years, Shneiderman has expanded the co-authors he’s collaborated with on Designing the User Interface. Fellow HCIL member Catherine Plaisant came on board as co-author for the fourth edition in 2004, along with Steven M. Jacobs (Northern Arizona University) and Maxine S. Cohen (Nova Southeastern University). Now the 6th edition also includes contributions by HCIL members Nicholas Diakopoulos and Niklas Elmqvist. Designing the User Interface typifies many of the qualities that make the Human-Computer Interaction Lab such a unique environment. Not only does it feature foundational work by well-respected experts in the field, it is also built on collaboration and interdisciplinary discourse.